Urbaser Bahrain has developed an initiative whereby the traditional black plastic bags used by street cleaning workers are replaced by bags made of cloth from the employees’ own uniforms. This decision will also enable the use of plastic bags to be reduced by 50% throughout 2019. The street cleaning service uses more than one and a half million plastic bags per year. For this reason, one of Urbaser Bahrain’s basic objectives is to reduce their use. The company also strives to improve the working conditions of street cleaning operatives, especially in terms of ergonomics and comfort. During the working day, employees endure temperatures of around 40 degrees. 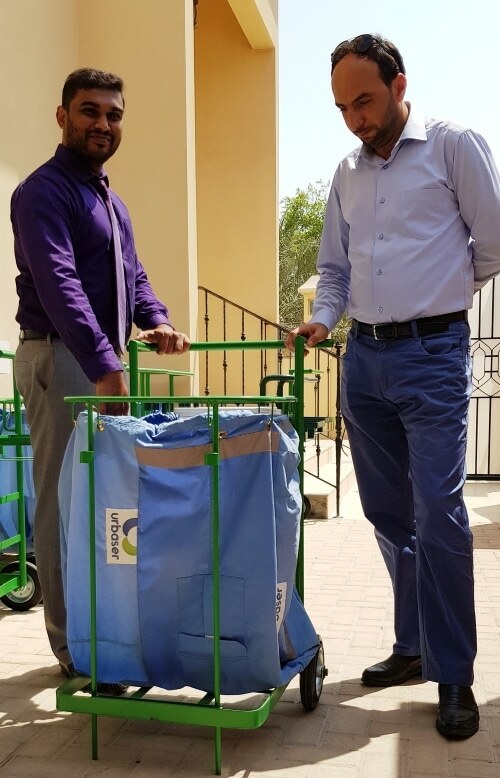 As a result of this social and environmental concern, Urbaser Bahrain’s Yassin El Belhouan and Deepak Hari Pillai, Operation Manager and Procurement Manager respectively, have designed a very light trolley with large wheels to improve its manoeuvrability. It includes a small refrigerator to carry cool liquids, which is also equipped with a cloth bag made from the worn uniforms of the employees themselves. The design has already been approved by the management of the company and the new trolleys are now being distributed. The Salman City urban development has been the first to introduce it, and it will be continued in the rest of the areas throughout the 2018.